different colors and glue onto a larger heart shaped paper. the perimeter using a hole punch. Let children lace yarn through holes. Make several pairs of matching hearts. Have children find the matching pairs. Set out different "love" themed stickers, for the children to stick onto a sheet of red, pink, or white paper. Set out red, pink, and white playdoh, along with "love" themed cookie cutters. Put out heart shaped, red, pink or other shaped/colored beads or macaroni. Let the children make necklaces for their "loved" ones (friends, family). Purchase large plastic sewing needles and sheets of plastic canvas (available at most craft stores). Cut an assortment of heart shapes from each sheet of canvas; then snip off any jagged edges. the perimeter of the heart shape or to create a yarn design of his/her own. invite them to lick their fingers clean. Yummy! challenge, create a stack of numbered cards to keep near your sensory table. Have a child draw a card and then try to find a corresponding number of hearts. In advance, purchase a variety of inexpensive lace with larger distinct patterns. press the lace into the dough, and then remove the lace. Look at that.... a lace design in the dough! 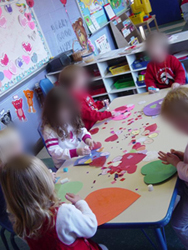 Let each child make a valentine for someone who lives in his or her house. children watch for their valentines to be delivered to their homes. pair of children when they have successfully "mended their broken heart." one on each tray. You can put the cut out hearts in a stencil box for the children to use in the art center. to make heart rubbings. Hearts cut from plastic margarine lids work best or from cardboard. pink, and purple paper. Instruct child to fish for a certain size and color. Cut a large heart from red or pink poster board. Cut into several pieces, making a puzzle. Let your child use a plastic knife to spread softened cream cheese on a piece of bread or a cracker. helping the child to see how the strawberry half looks like a small heart. dough is smooth and evenly colored. Store in an airtight container.